When opening and establishing a local business, even if your store or office is situated in an area with excellent footfall, developing your “brand” is vital for long-term success. Usually, when “brands” are discussed, it is in relation to multinationals and chain stores. However, branding is just as important for local businesses as it is in the bigger corporate world. Your brand is what sets you apart from your competitors and it’s how your business is perceived by your target market so doesn’t it make sense to get your branding right? You might have a vision in mind for your company’s brand, but no one is ever going to know what that is unless you start promoting your brand to ensure that your target market is exposed to it. The good news is that you don’t need to have a huge budget to make this happen. Making your mark in your local area simply requires consistency and creativity. 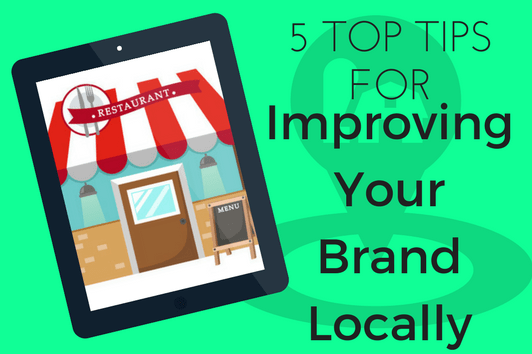 That said; we’ve put together a quick guide to 5 top tips that you can utilise to cost-effectively and successfully establish your brand locally. To encourage your local community to trust and invest in your brand, invest in your local community. Sponsoring local events, teams or groups is a very effective way to ensure that your business is exposed to a lot of people in your area and it helps to build a positive perception of your business. This, in time, can provide you with an excellent return on investment so forget about the short-term costs and consider the long-term benefits for your business. Many local brands abstain from utilising social media to promote their business as they feel it is a tactic only suited to large companies. Establishing a social presence creates a place where people can actively engage with your brand and social advertising offers an inexpensive way of extending your reach in your local vicinity. Advertising on Facebook does not require a crazy spend – you can spend as little or as much as you want. You just have to know how to target your ads properly and you will see big results. Social media is the ideal medium to achieve both brand awareness and lead/sales generation goals so don’t be left in the dust because you can be sure that 99.9% of your competitors are being social. Building a trusted brand will require you to form and nurture relationships locally. Identify local businesses, influencers and individuals in your area who can help promote your business. Align with complementary businesses, promoting each other’s products or services on your premises through the placement of posters or leaflets. Partner with complementary businesses, promoting each other’s products or services on your premises through the placement of posters or leaflets. From running joint competitions on Facebook and doing cross promotions to collaborating for a local fundraising event, there are so many ways that you can work with the other businesses in your local community to benefit your brand. Just like social media, SEO is not just for the ‘Coca Cola’s’ of the world. Establishing a local search presence can have a monumental return on investment for your business. Consumer behaviours are now significantly online driven so your potential customer’s first port of call when looking to find your product or service is to perform a search on Google. A small, ongoing investment in SEO can help to build strong search engine rankings for local searches for your products or services and ensure your business is visible online to the Google users who wouldn’t be able to find you any other way. You can read more about local SEO for local businesses here. Association with a local business group or chamber can help to establish credibility for your brand and memberships of such groups also offers the opportunity to mix with and build relationships with local business leaders. Yes, it might take some time and effort to join these groups and give them the input that’s required, but give it your all and you will see results. Also, don’t be afraid to chat with other business owners in your area that are members of such groups and ask about their experiences. If you’re trying to build, position and market your brand locally, you most likely have lots of ideas but little budget to work with. If so, we hope that you can implement some of the above 5 tips to maximise your time and budget to successfully establish your brand locally. If you’ve any questions about any of the above, we’d love to hear from you so feel free to get in touch with us and tell us more about your goals and challenges when it comes to brand awareness.